Hands-on with Shadow of the Tomb Raider at its gameplay world premier event. At an event at the Mayan Theater in Los Angeles, the first gameplay of Shadow of the Tomb Raider was revealed. Shadow of the Tomb Raider is the third game in the franchise's reboot, and it concludes the evolution of Lara Croft from a survivor to a full-fledged Tomb Raider. This final transition won't be easy for Lara, though, as she'll learn that her actions have consequences, not just for herself but for those around her as well. The demo began in Cozumel, Mexico during a D'a de Muertos celebration. 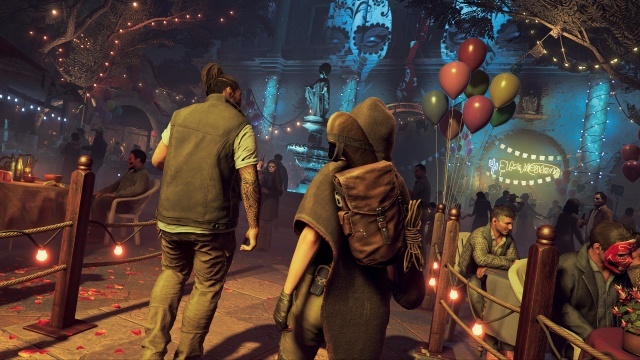 Lara is there with her friend Jonah tracking down the leader of Trinity, Dominguez, in an attempt to learn what they are looking for in Mexico. This leads to a 'blend into the crowd' stealth sequence as Lara shadows Dominguez and eavesdrops on his conversations. The striking part of the demo's opening is the celebration that is taking place around you while you focus on your objective. A large crowd is celebrating, listening and dancing to a band, and haggling with street vendors. Sure, they're all there to provide you with some cover, but the atmosphere is both realistic and intoxicating in a way that almost tempts you to forget Dominguez for a bit and just enjoy the festivities. Unfortunately for Lara there's no time to party as she learns that Trinity is running an archaeological dig site nearby and is searching for the entrance to a massive underground Mayan temple. 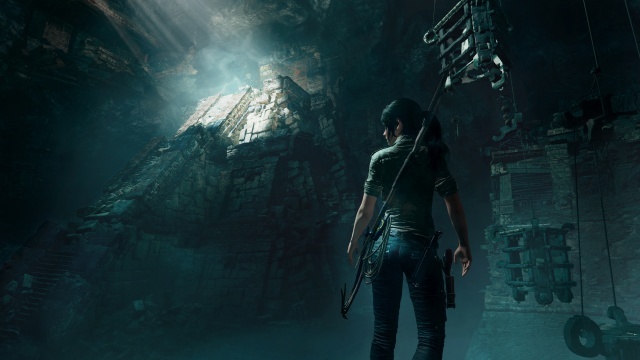 Lara is able to interpret inscriptions at the site to learn of a secret entrance through a cave in a cliff above the sea. This leads to a grappling sequence that has you navigating towering, broken cliffs while the sea rages below you. Some of the moves required to navigate the cliffs will be familiar to anyone who's played the prior Tomb raider games, but this time out Lara also has the ability to repel. This opens up her move set to add more ways to vertically navigate obstacles and gives her the ability to swing on the rope between platforms and surfaces. Once in the cave Lara finds a large Mayan temple, and the tomb raiding portion of the demo begins. With Shadow of the Tomb Raider, the game's developers want to tap into the series' roots and provide tombs that will require you to use both your brains and reflexes to survive. The Mayan temple in the demo certainly shows that they are delivering on that promise. There are underwater passages to navigate, forcing you to push your way through without error lest Lara run out of air and drown. The interior of the temple is a large open space, filled with platforms on pulleys that you'll need to navigate to reach the top of the pyramid. You'll not only need to traverse them with skill as they swing when you latch onto them or begin to drop form your weight, but you'll also need to solve puzzles in order to swing new platforms into place to give you a way across a chasm. Lara will die a lot as you try to learn the layout of the platforms, but the game is forgiving in where it respawns you after each death, so you won't have to retrace too long of a path after you make a mistake. Once Lara reaches her goal, in her haste to beat Trinity she will take an ancient artifact without taking the time to think about what she is doing. Unfortunately Trinity is right behind Lara and takes her and the artifact back to their dig site. Lara manages to free herself from captivity, and this launches the next gameplay sequence as Lara attempts to escape the heavily guarded site. Using stealth and taking out the guards one be one as you make your way to the exit will give you the greatest chance of survival, but before I made it through the final gate I found myself in a firefight. The gunfight was both fun and challenging, so Shadow of the Tomb Raider looks like it will deliver on the shooter action as well as the traversal gameplay. Once back in Cozumel Lara will truly be forced to face the consequences of her actions. A raging storm unleashed by the removal of the artifact has sent a massive flashflood through the city, washing people away and destroying buildings in its path. 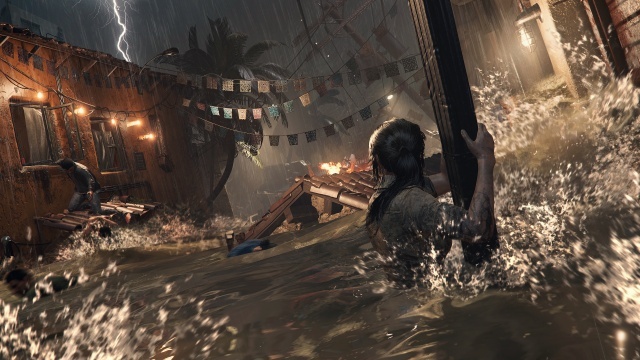 Lara herself gets swept up by the rushing waters, and this leads to a fast-paced sequence that has you dodging wreckage, navigating objects being pushed along by the water, and surviving underwater areas filled with debris between you and life-saving oxygen. You'll feel like you need to pause and catch your breath with Lara once you make it through. I see why Square Enix decided to use this level for their hands-on debut of the game. 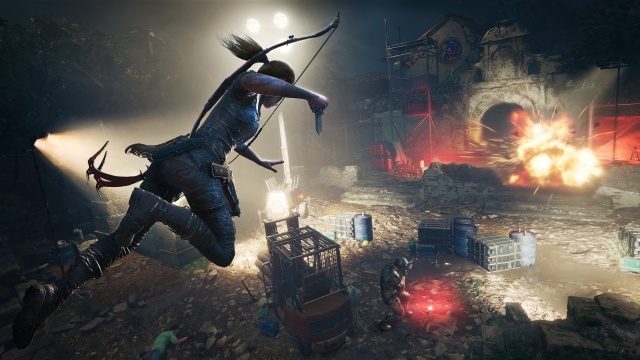 It includes all aspects of Shadow of the Tomb Raider's gameplay and highlights a defining moment for Lara in her evolution into a full-fledged tomb raider. The demo was a lot of fun to play, and I'm looking forward to seeing more of the game in the coming months.